Water Temp(f): 58 (wow, warm)! There are only two crew members who work harder than the skipper. One is Monte, who plies his trade 24/7. The other is the #2 genoa, which is almost always flying. Exceptions are very light air, in which case it’s the #1 or the spinnaker, or very strong winds, in which case … well, nope, it’s still the #2 then as well. 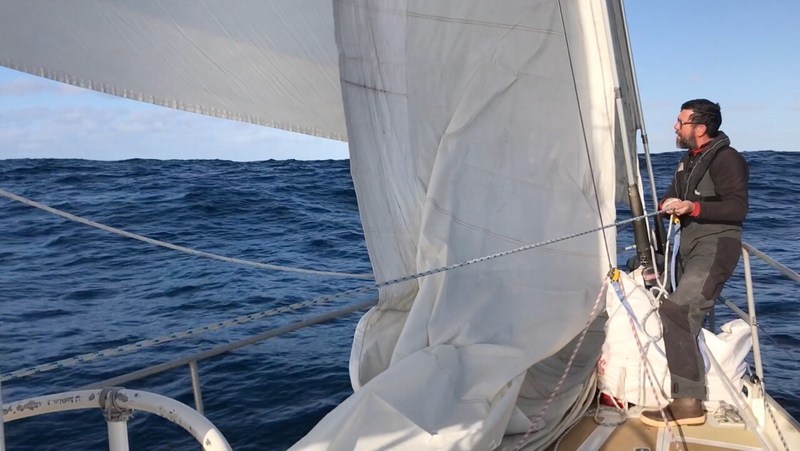 For heavy stuff, Mo has a perfectly good, tiny staysail, and I had HOOD rush-order a more classically-cut storm jib between voyages. Neither has been up during this Figure 8 2.0. All the tough weather has fallen to a very tightly rolled #2. 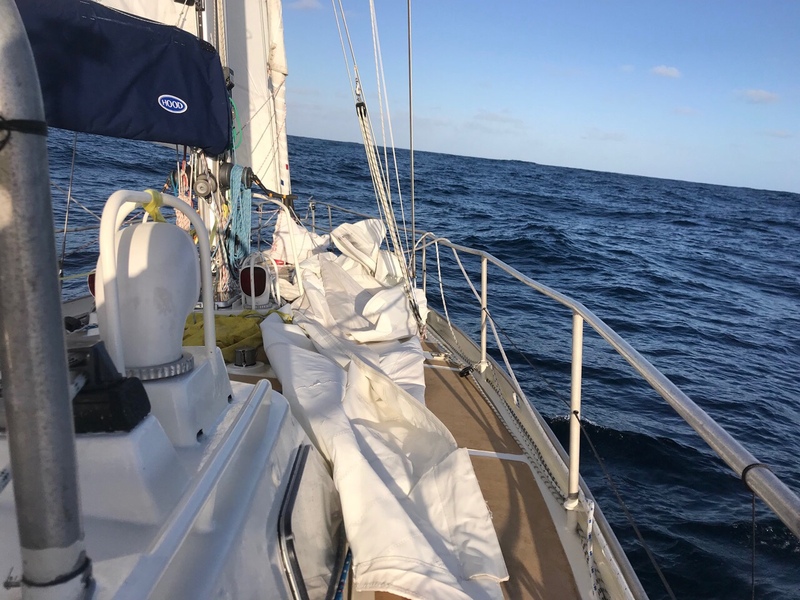 So, the math: last year’s Figure 8 Voyage 1.0, at roughly 25,000 miles, was a solid six months of sailing, during which the #2 flew (a guess) 80% of the time. During the first 17,000 miles and four months of the Figure 8 2.0, his work has been nearly constant. 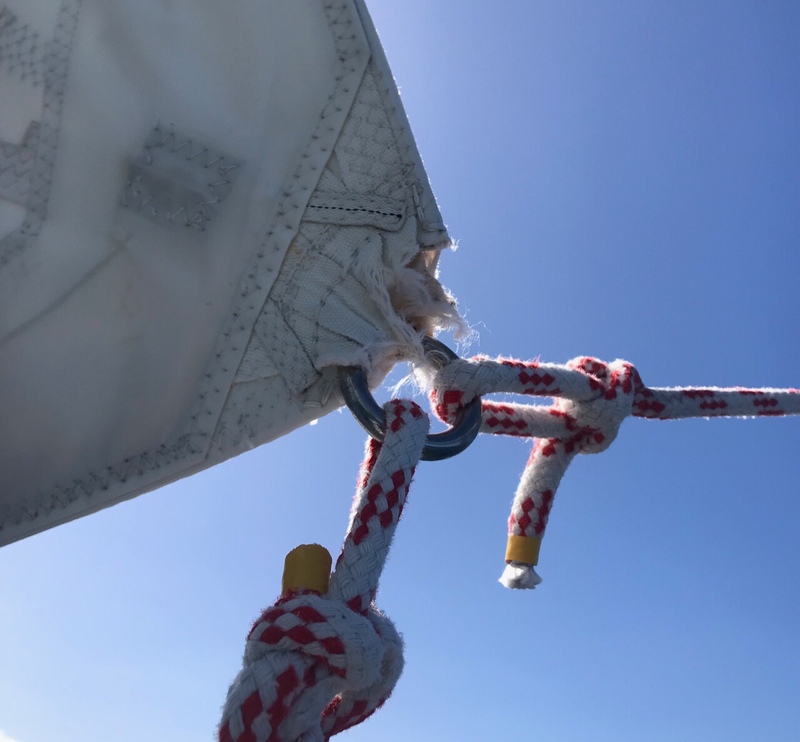 I was reminded how tough the sail is when I had it down on deck yesterday and was trying to fold it. 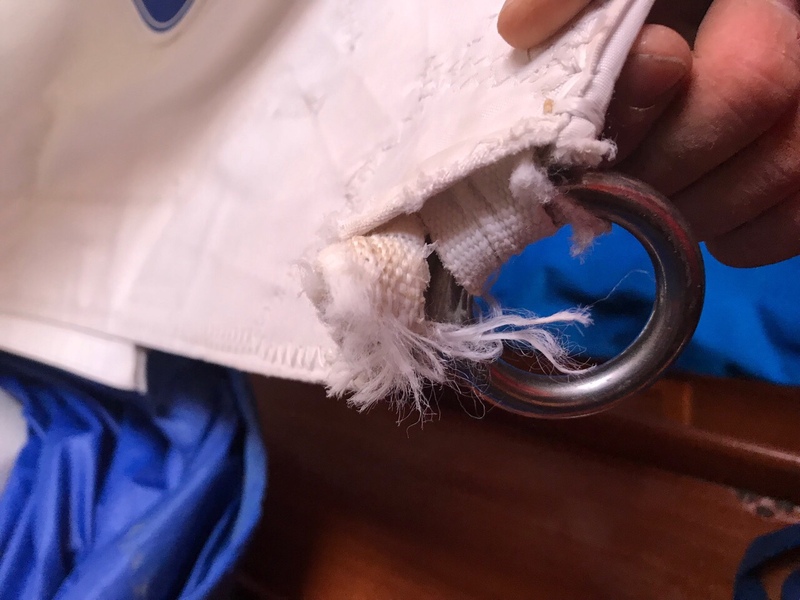 The triple stitching on every panel and the triple reinforcement at the “reef” points make the sail incredibly stiff, even now. Folding is a wrestling match. That said, and given the miles, I am not surprised the sail needs some care. I could, however, wish this fix was easier. My Idea: I don’t have any one-inch webbing aboard, so my first thought was to use the soldering torch (with the pin-head attachement) to burn small holes in the clew reinforcement (there is so much reinforcement I’d NEVER get a needle through with a palm; likely not even a jack hammer) and then lace the ring to the sail with Lash-It (twine-sized Dyneema line). Yes, Robin is still speaking to me after I put that solution on the table. Robin’s Idea: Randall, you DO have one-inch webbing aboard in the form of sail ties. Cut sail ties to the length of old webbing. No, don’t use a solder torch (what a mess! ), instead use a hand drill to ream out small holes in the reinforcement. Then sew the sail-tie straps over the old webbing. Not yesterday, though. That was all about dousing and launching. I bunged the poorly-bagged sail in the anchor locker at sundown and called it a day. 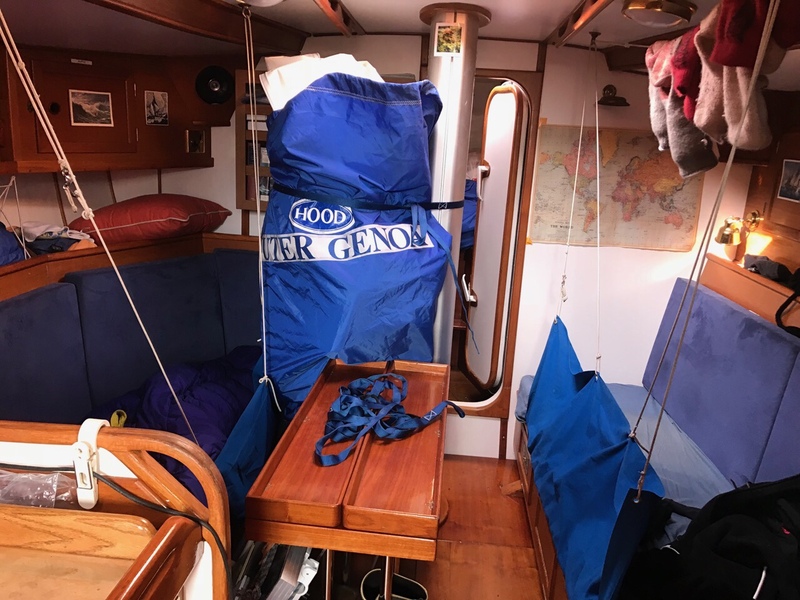 Today, the sail has been properly folded and brought into the cabin. Great idea for a fix. I’ll make a mental note of that. It looks kind of twisted. Assuming that is the starboard sheet, is the port sheet pulling the ring and wearing on the webbing? Is there any nicks in the ring? Thanks for the post and photos.